Scaring trick-or-treaters on a dark Halloween night seems easy enough, but what does it take to strike fear into the hearts of cartoon fans? 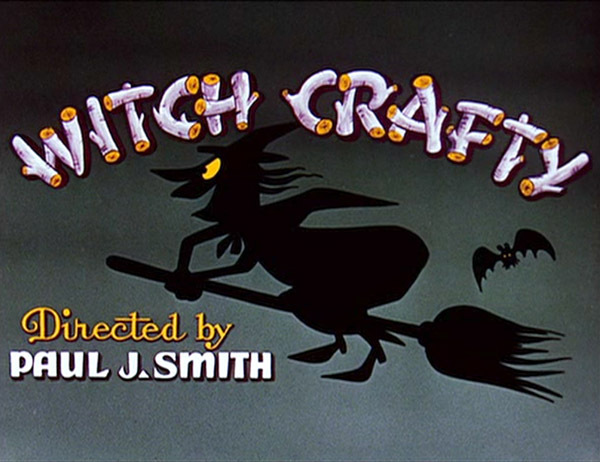 To find out, let’s travel back in time sixty years ago to see how the fortunes of a studio may have tilted on the axis of a mostly forgotten cartoon, Witch Crafty (1955). Even watching it today, this cartoon appears promising in its opening moments, with an inspired bit of action and effects animation. A witch flying on a broom delivers a fun aerial sequence—she spins around a mountaintop, whooshes through clouds, dances on her broomstick, and then crashes into a chimney. As she slides down the bricks, it becomes clear how the cartoon will play out. Woody Woodpecker is working the night shift at a broom factory. When the witch realizes she has broken her broom, she inquires for a replacement. Woody agrees to make her a new one for only 50 cents, but when she swindles him a conflict ensues between the two. The story team are Mike Maltese and Homer Brightman. Despite their notable careers in animation, this seems an underperforming attempt from them. There is not much in this premise to really ratchet up the gags. The witch is not much of a foil or even an eccentric character. Witch Crafty never really finds a rhythm or offers something clever to make us laugh. 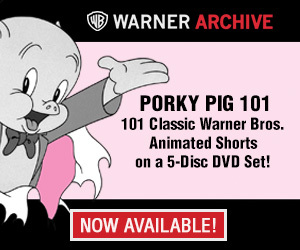 And here is why, looking at the Lantz studio releases for 1955, that this cartoon deserves to make us SCREAM: it marks the moment when the Walter Lantz cartoons take a precipitous turn for the worse, commencing a nosedive from which they never recovered. However, at that moment in time, there was still a reason to be hopeful. The cartoon released the previous month was Crazy Mixed-Up Pup, starring new characters Maggie and Sam, and it was followed by the classic Legend of Rock-a-bye Point, a Chilly Willy short. These were reinvigorating the Lantz slate of cartoons because each was directed by none less than Tex Avery. The Avery-Maltese pairing should have been a longstanding collaboration that would have minted more classics for years to come. Unfortuately, a financial dispute kept this from happening. Avery at this point in his career was expecting more than a salary. He wanted a share of the back-end profits. In fact, he had begun directing at Lantz with certain expectations that began to unravel when he became aware of complicating factors that he felt would compromise his split. Walter always maintained that if Tex had stayed that he too would have gotten rich, but their negotiations soured. After one more cartoon—the oddly or maybe aptly titled SH-H-H-H-H-H — the great Tex Avery was gone and never returned. And ever since Lantz had moved his studio to Seward Street in Hollywood a few years earlier (after an initial period of directing by Lantz himself), Don Patterson had been the director who was capably handling the Woody series, but suddenly in 1955 there was turnover that altered the creative talent at the top. Avery preferred not to work on Woody, so he developed the ‘specials’ or non-Woody cartoons that had previously been assigned to Paul J. Smith. With the departure of both Patterson and Avery, Smith was effectively promoted to the ranking director in charge of the Woody Woodpecker series, which he never relinquished. When Lantz closed his studio in 1972, Smith was there to call it a career with his boss. Not much is made of what an omen Witch Crafty turned out to be, like a signpost that pointed to one path yet fortune should have picked the other. Had the Avery dispute been ironed out, the mediocrity that defines the later years of Lantz cartoons might have been avoided. As well, Tex might have stayed a director of theatrical shorts, which suited him best, instead of working on animated commercials and then forgettable TV shows. Sandwiched between two parting gems from a comedy master, Witch Crafty provides an inciting incident that now seems like ironic commentary. Instead of paying the meager 50 cents for the broomstick, the witch rubber-stamps the inkprint of a coin on Woody’s hand, and so they fight. But only for a dispute over money that would maybe seem like chump change now, cartoon fans are forever without an additional—yes, possibly!—17 years’ worth of Tex Avery cartoons. And that is a blood-curdling horror story fit to bring out a frightful round of screams on this Halloween day. One of my all time favorite Woody Woodpecker cartoons. Love the part where the witch tries in vain to get her broom back and even tried to used a toy windup chef to deliver a “red hot” wiener to Woody and he exchanged the wiener with a stick of TNT and a sign that said “Pay 50¢” and after the TNT blew up the windup toy chef was battered,bruised and his arm in a sling walk out on the witch by walking on her. I wonder if the rarely seen Spook-a-Nanny is on that DVD? Yes – SPOOK-A-NANNY is on that DVD. Actually this cartoon is not as bad as it’s made out to be, it’s pretty funny actually. The timing is quick, there are fast scene cuts, the jokes are silly and there’s still an Avery-esque humour (the witch’s shapely leg w/ garter, the ‘old maid’ undergarments, smashing head-on into walls/ trees/ chimneys) that keep the cartoon moving along. At least every attempt from the witch has a reminder to the audience of why she’s trying to get back into the building… Pay 50c! It’s almost as if Woody takes a back seat to the witch’s antics. I like how Woody appears to be getting tired of foiling the witch’s attempts to get her broom back: “C’mon lady, why don’t you just pay the 50c?” A laugh in itself, as the defending characters historically seem to take delight in tormenting their antagonists. I agree completely with all the gags you mentioned, along with others like the machinery that grinds down a whole tree to produce one broom handle (later doing the same to “Granny,”) all the junk that falls on the floor while she’s searching for the 50 cents (a “pin-up” picture of Frankenstein’s monster, a badge reading “Operator 13,” and everything from dice to dentures,) they’re all pretty great. And you’re right about Woody’s performance too. I’m sure that was Gracie as the witch as well; she was good in both roles. There’s no point in speculating on how long Tex Avery might have stayed at Lantz’s studio. I certainly doubt it would have been 17 years, especially considering he had no desire to work on Woody Woodpecker cartoons in a studio where Woody kept everyone’s bread buttered. To me, “Witch Crafty” fits in perfectly with the kind of stories Lantz was producing around that time, in pictures like “Niagara Fools,” “Room and Wrath,” “Box Car Bandit,” etc. And they’re pretty damn funny too. My favorite scene; the Witch’s hair after coming out of the washing machine! 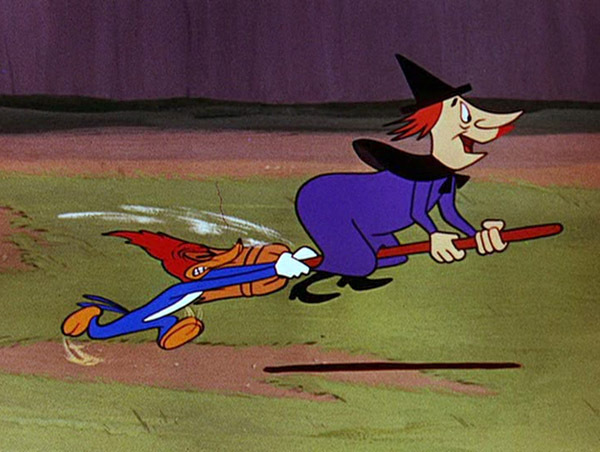 Smith would still have about another year of turning out decent cartoons like “Niagara Fools” or “Arts and Flowers” before the bottom really fell out, though the design of a witch here if a forerunner of how all of Smith’s supporting characters in his efforts would be drawn by the late 1950s. But the studio likely still would have been better off if Don Patterson had been retained as director and Lantz demoted Smith back to the animation department. No mention is made of Alex Lovy, who was there after Tex and whose style from that point may not have equaled Avery, but showed the influence. I think some of Lovy’s cartoons, like “Hold That Rock”, had been storyboarded by Tex. The story as I remember Walter Lantz personally telling it to me: Tex went to Walter’s distributor, behind Walter’s back, and tried to convince that distributor to dump Lantz and let Tex provide cartoons from that point on. The distributor, a personal friend of Walter’s, called Walter and told him that Tex was in his office (“I’ve got some guy named Avery in my office and he claims he can make cartoons better and cheaper than you can! Now what do want me to do with him?”). Naturally, Walter told him to kick him out. When an embarrassed Tex returned to Lantz’s offices, Walter chewed him out and fired him on the spot. The other thing that I remember Walter saying about Tex: Tex Avery was a brilliant guy, but he never created a successful character that audiences wanted to see over and over again, one that could keep studio afloat. John, that anecdote’s true, and the “distributor” you mention is a Universal Pictures executive, Henry Henigson. However, that incident happened in the 1930s when they were making Oswald cartoons on the studio lot and Tex tried to leap-frog over Walter. Yes, it was a pretty bold power-play that didn’t succeed. But I’m glad you brought it up: over twenty years later in 1955, it might have still cast a shadow over the professional relationship between Lantz and Avery. It may have contributed to a lingering distrust between them. Thanks everyone for the comments and opinions. Joe: I appreciate you stating the true nature of those first post-Seward St cartoons, and also it’s an honor to have your feedback on my posts–you’re the reason I ever set my sights on Lantz and Avery cartoon history two decades ago. Yes, though Walter has directing credits in 1951 (I was referring to his ‘official’ screen credit), Lundy deserves recognition for his prior efforts, since layout and timing had already been done. Also, I would agree with comments that Witch Crafty is certainly not “the bottom fallen out” yet at the studio, but my point was that it marks the beginning of a downward trend. Kel: it’s true that Alex Lovy did a good job taking over the Chilly Willy series from Avery. The testament to that is Chilly became an enduring character and that Lovy retained the comedy model that Tex started. If you look at all credits for Lantz cartoons from late-’55 to ’66, it’s clear that Smith is predominantly directing Woody (“A”) and the other unit director (“B”) more often is not. If Avery had remained, he would have had the opportunity to direct Chilly and other characters to his liking. From ’66-’72, Smith was the only credited director at the studio. It is purely wishful thinking and the stuff of alternate history, but how different things might have gone for the reputation of late-era Lantz cartoons if Tex Avery had been there for that last stretch. Lantz will always remain both an animation pioneer and a key player in the Golden Age, so his legacy is secure, but losing Avery in ’55 was The Fish that Got Away. 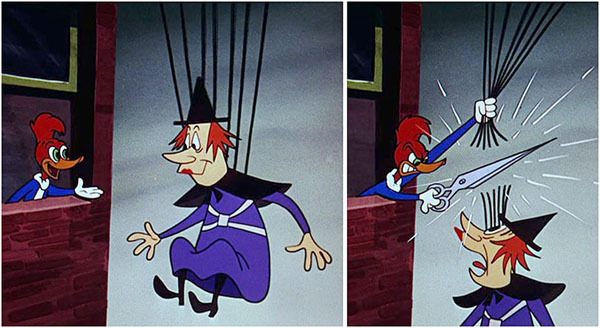 I wonder if Avery had anything to do with creating Inspector Willoughby, who was obviously a humanized Droopy. I’m glad Alex Lovy is being mentioned here too. He did some late-50’s Woodys along with the Chillys and one-shots, and all were quite entertaining. I’m very fond of his one-shots with a nebbishy little character ironically named “Hercules.” “Plumber of Seville” and especially “Goofy Gardener” have almost the kind of comic sensibility later associated with Benny Hill. Now that I think of it, and I honestly hadn’t until now, Hercules was (at least in appearance) something of a prototype for Inspector Willoughby!